BATON ROUGE, La. – A sluggish start in Baton Rouge saw the University of Arkansas women’s basketball team fall 71-34 in Southeastern Conference action at LSU. The Razorbacks (16-8, 5-5 SEC) started the game in a zone defense and LSU’s quick passing got the Tigers (13-8, 4-5 SEC) open looks. LSU shot 55% percent in the first half as Arkansas fell behind 36-10 at the break. Uncharacteristic turnovers took away important possessions as the Razorbacks had 13 miscues in the first 20 minutes. Arkansas had a spark to start the third quarter with a 7-0 run that saw LSU turn the ball over five times. The deficit, however, was too much to overcome for the road team. Chelsea Dungee finished with a team-best 14 points and Malica Monk added 12 points for Arkansas. The Razorbacks finished 0-for-10 from distance, the first time since 2013 that Arkansas did not make a 3-point field goal. •Arkansas had eight first quarter turnovers. •Five first quarter and second quarter point are a season-low for the Razorbacks. •The halftime deficit, 26 points (36-10) is the most of the season. •Chelsea Dungee scored in double figures for the 21st time this year. •Malica Monk scored in double figures for the 19th time this year. •It was only the fourth time of the season Arkansas had 15+ turnovers. •Arkansas did not make a 3-point field goal. The last time that happened was an 0-for-10 performance at Mississippi State on Feb. 3, 2013. •Arkansas has forced double figure turnovers in every game this year. There are only three more chances to see the Razorbacks at Bud Walton Arena during the regular season. 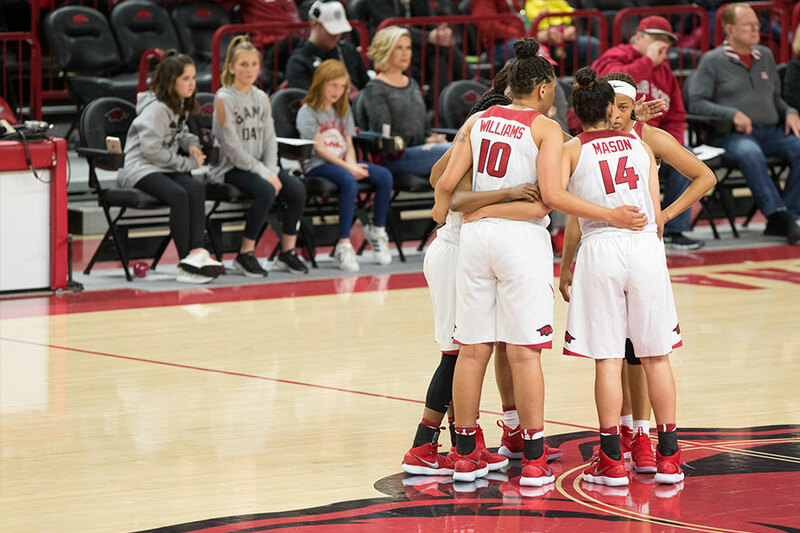 The Razorbacks host Auburn on Sunday in a 1 p.m. game televised by the SEC Network. Arkansas travels to Kentucky and Georgia before back-to-back home games with Ole Miss and Missouri as February winds down. •Sunday’s game is presented by Mercy and United Healthcare Services. •Fans are encouraged to wear pink and pink pom poms will be distributed as they enter the arena. •All tickets are $1 and kids 12 and under get in free with a paying adult. •Breast Cancer Fighters and Survivors will be recognized during pre-game as well as a special halftime tribute to India Lewis.